July 2018 was a true test of dedication and the Washington Area Tougaloo Alumni Chapter (WATAC) won “hands down!” In spite of the sporadic almost monsoon-type weather, the entire Mississippi On the Potomac Weekend did not disappoint, not one bit! Broadway came to the Watergate City with a kind of nostalgia at the Kennedy Center that had us all dancing in our seats and in the aisles. For the MOTP opener, all the Temptations’ hits were featured in the production, “Ain’t Too Proud to Beg.” The vocal talent, the acting, the storyline and oh, those moves, the choreography, that is, just transported us in time. The blue skies certainly did smile on us for the Golf Tournament at the new location, Penderbrooke in Fairfax ,VA. By all accounts, this location is a keeper. The MOTP 1st Place was proudly won by Lee Hall, DDS, John Rosenthall, Mark Olsen and Eric Cole. They look forward to a repeat performance. Just when we thought that surely we would be rained out, over 100 faithful alums and friends from Memphis, all points in the ‘Sip, including the Gulf Coast, Philadelphia, PA, Atlanta, GA and the DMV converged under the Bretton Woods Pavilion to the oldies and current sounds of the Young Bucks. Chef Gilbert kept the catfish buffet brimming and topped it off with Grandma’s peach cobbler. Youngsters and those young at heart had unbridled fun, great food, all-day shopping , raffles, do- your- own -thing and line dancing, all so worth the trek in the rain. Thanks primarily to the efforts of Norma Dorsey and Sandra Peaches, the Sensational Silent Auction was packed with “must-have” jewelry, artwork, handbags, books and restaurant certificates. “I ain’t jiving I’m jamming” at the Savoy,” is what I think I heard someone say about the MOTP Sunday brunch. Lori Williams shuffled the schedule of her European junket to join her friends to be with us at Rosa Mexicano where they sealed the deal on a delightful, light-hearted, relaxing afternoon. Fine food, endless margaritas and sangria with jazzy, mellow, spirit-filled melodies…What more can you ask for? (Good food, good friends and wonderful soulful music!). Actually, it may sound like a mindless, raucous good time and a good time it was, but it is anything but mindless. 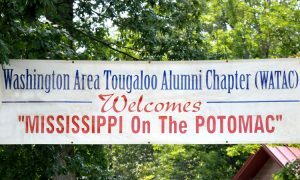 Mississippi On the Potomac is a strategic plan to forge fun and legacy- building to support the mission and goals of Tougaloo College. In addition to contributing to the General Scholarship Fund, WATAC selects six WATAC scholars to receive $1000 each for the academic year. 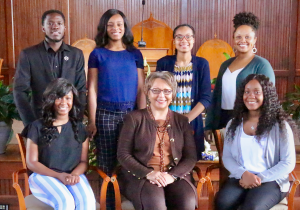 For the 2018-19 academic year, the recipients are: (standing l – r) Dedrick Barkley, Lillian Scott, Enleyona Weir, Jazmine Baylor, (seated l – r)Tyra Franklin, President Hogan, Jaimee’ Mitchell. The WATAC Scholarship application can be downloaded at: https://tcnaa.org. Select Scholarship Application from the Download menu. Mark your calendar now for July 18-21, 2019! Make it a real family getaway, add a few days and let us help you plan to join us and enjoy visiting the National Museum of African American History and Culture and the MGM -National Harbor along with the traditional yet diverse sites of the Nation’s Capital. Be a part of and encourage others to be in the inter-generational, engaged village/family of alums and friends who are dedicated to making a difference and perpetuating the legacy of Tougaloo College, where history is meeting the future with each energized, focused and prepared graduate. The Mississippi On the Potomac Weekend is a village effort of loyal sponsors, dedicated alums, unwavering volunteers (volunteers coordinated by Trussell Lewis) and steadfast friends and family. WATAC welcomes you as a partner “come rain or come shine” for Tougaloo College.